Nathan's Real Estate Notions: Property Tax Reduction Deadline! Did Your Home Drop in Value? Do You Need Help With Getting it Re-Assessed? I am currently helping people contact the Santa Clara County Assessor’s Office to get their property value re-assessed to reduce their property taxes for 2010. If you would like some help, please contact me ASAP. The deadline is in 4 DAYS - August 15, 2009. Large 2 bedroom 2.5 bathroom townhouse for sale priced at $419,000 with an attached garage just minutes from Santana Row. Check it out at http://www.485quailbush.com/ and see all the disclosures, inspections, virtual tour and an abundance of photos. This place is amazing! Who turned up the heat?? According to Pete Carey of the Mercury News the Santa Clara County bidding wars are back. The recent Monday article explains exactly how tough it is out there for buyers. The full article can be found here http://www.mercurynews.com/ci_13028660?source=most_emailed. I normally do not agree with the facts that the media produces, but in this instance, they were on the mark. After pondering it for a while, I realized I agreed because they used local Realtors to give local reports. 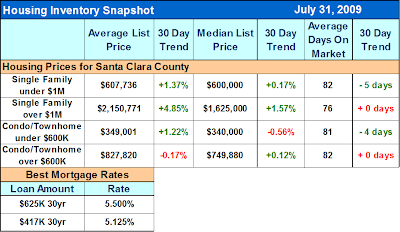 Buyers in Santa Clara County do not care what is affecting buyers in Wyoming, or any other “National” statistic. Real estate is bought and sold locally. It needs to be addressed and analyzed on the local level. Incentives for buyers are going on right now! Are you aware that first time buyers* who purchase in 2009 might qualify for an $8,000 tax refund from the government? Click here to learn more. County-wide inventory has dropped 500 homes/mo. for the past 4 months. Purchasing has become tougher because of all cash offers. Prices are rising! Areas that saw the largest declines are posting higher dollar values. Rates might rise 1% in Q1 of 2010. $8,000 buyer tax refund is not well-known by buyers. Median list price for homes below $1M has hit $600K! Time on the market is shortening again, which is a sign of multiple offers. Below is the updated chart of sales in all cities East of Highway 880. Now we have seen 12 consecutive months (1 FULL YEAR) of demand exceeding supply. If the graph below does not appear click here to view it. For Comparison: Here is the exact same chart for cities West of Highway 880, and we see struggling home sales. If the graph below does not appear click here to view it. Fewer properties will be coming on the market through the end of 2009. Buyers will continue to receive great deals and the threat of rising interest rates and losing out on the $8,000 tax credit will be playing a larger role than the threat of prices going down. Enjoy the rest of your week and if you know of a friend, co-worker or family member who really wants to buy a piece of property and needs some sound unbiased advice let me know. You can count on me to provide it.